Birth of Harold Walter Wright recorded December quarter 1893 at Dudley. 5 Darkhouse Lane, Coseley, Staffordshire. Edward Wright (39, Railway Signalman, born Lapley), his wife Mary A. (39, born West Bromwich), and their 7 children: Francis E. (12, born Sedgley), Dora A. (10, born Sedgley), Harold W. (6, born Sedgley), Ada Mary (6, born Sedgley), William (4, born Sedgley), Dorothy E. (3, born Sedgley), and Horace L. (2, born Sedgley). 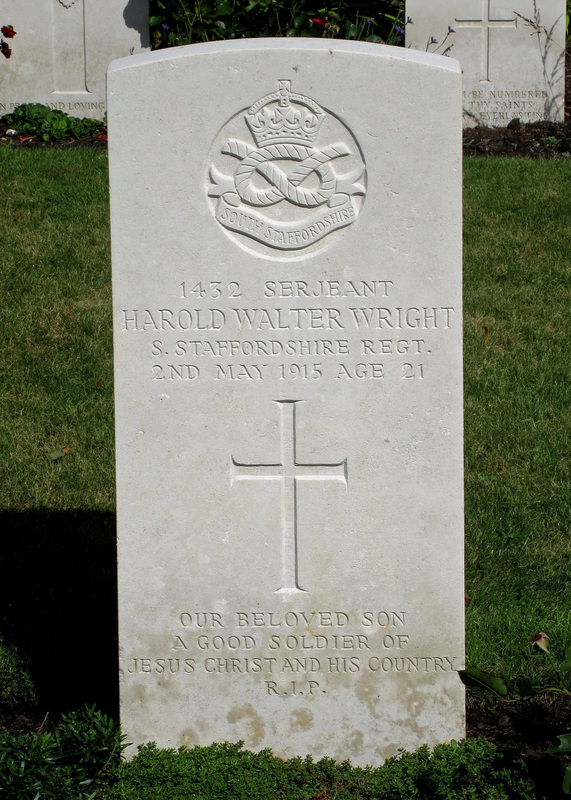 Albert and Harold Wright were brothers. Harold had been killed on 2nd May 1915, one of the earliest casualties of the 1/6th South Staffords. Albert was employed by London and North Western Railways at Wolverhampton Railway Station as a Goods Porter. He is commemorated on the Wolverhampton Station memorial, sited on the footbridge at Wolverhampton Station. Albert’s parents paid 15 shillings and 9 pence for the following words on Albert’s gravestone: “Our beloved son. A good soldier of Jesus Christ and his Country. R.I.P.” The same words were inscribed on his brother Harold’s gravestone. Harold landed in France on 5th March 1915 with the 1/6th South Staffs, within 2 months he had been killed. The South Staffs were part of the 46th (North Midlands) Division, the first totally Territorial Division to arrive on the Western Front. After a short period of trench familiarisation near Armentieres, the battalion moved to Wulverghem, about 7 miles south of Ypres, and to the west of Messines. This was thought a relatively quiet sector where a novice unit could gain experience of trench routine. From 6th April the 1/6th South Staffs alternated with the 1/5th South Staffs between the front line, just to the north of the village of Wulverghem, and Bulford Camp. For their time in the trenches from 6th April to Harold’s death on 2nd May, the predominant entry in the battalion War Diary is “Situation quiet”, however in that period the battalion had 13 men killed. Most of these men are buried in Plot I, rows F and G on St. Quentin Cabaret Cemetery at Wulverghem, Harold is amongst those burials.